Michigan is once again raising the bar on fun and engaging street art. First artist Jonathan Wright places enchanting fairy doors all over Ann Arbor to delight locals, and now even more creative treasures are waiting to be found thanks to dad Aaron Zenz and his six children (ages 5-17). 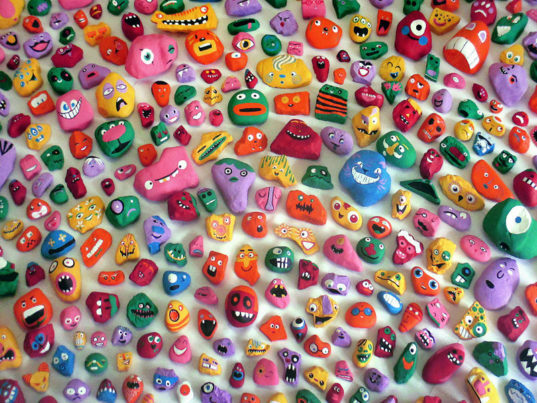 Over the course of a year, the family painted 1,000 quirky, colorful rocks in matching pairs. One rock from each pair is on display at the Grand Rapids Children’s Museum, while partner rocks are tucked away in various locales around Grand Rapids for folks to spot! Not only was this ArtPrize project no doubt a wonderful bonding experience for the family, painting is also a relaxing activity that’s a refreshing departure from constantly being plugged in to technology. As seen in the video above, the family also spent time placing 500 of their painted rocks all over the city, enabling them to explore the great outdoors. This “Rock Around” project also creates a ripple effect by encouraging countless other families to get outside, “walk around” and find as many painted rocks as they can. To be a part of the larger art movement, families can photograph the rocks they spot and share their pics on social media with the hashtag #RockAroundGR. Michigan is once again raising the bar on fun and engaging street art. First artist�Jonathan Wright places enchanting fairy doors all over Ann Arbor to delight locals, and now even more creative treasures are waiting to be found thanks to dad Aaron Zenz and his six children (ages 5-17). Over the course of a year, the family painted 1,000 quirky, colorful rocks in matching pairs. One rock from each pair is on display at the Grand Rapids Children's Museum, while partner rocks are tucked away in various locales around Grand Rapids for folks to spot!